Upgrade to the all new 2015 The Rack Engine Engineered Design and Quote Program from UNARCO. Step by Step – Build your own rack system. Start by entering the size of your Mezzanine and stair details, then let the descriptive graphics guide you through the process with easy to understand details of your project. Automatically generate a bill of material with part numbers, weights and pricing. 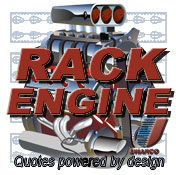 Automatically upload your Rack Engine quote into the UNARCO system for seamless ordering. Professional Drawings Sets are created to help customers visualize their project and verify data. Print out drawings and attach to proposals and quotes.Software modules include Selective Pallet Rack, Structural Pallet Rack, Drive In rack, Carton Flow rack,Pallet Flow rack, Push Back rack, Cantilever Rack and Mezzanines. 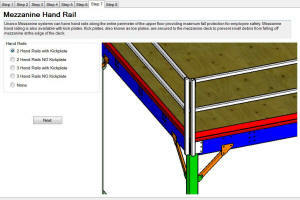 Complete Project Review automatically calculates hardware and recommends proper durability add-ons and accessories for your project. There is no pallet rack manufacturer with more engineering experience than UNARCO Material Handling. The Rack Engine is fueled by that powerful engineering to calculate simple designs that are efficient and practical. Time-saving, easy-to-use interfaces put that engineering power in your hands for professional designs and presentations. 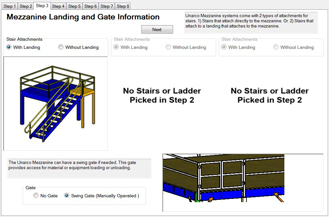 Step by Step queries and forms guide you through the design of your Mezzanine system. Automatically generate a bill of material with part numbers, weights and list pricing. Select handrail, stair and gate options with a simple click.